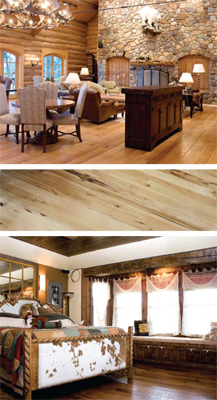 Hank Adams, owner of Buckeye Hardwood & Lumber Co. operated out of Arlee, Montana, believes that when searching for the ultimate “green” product, one does not have to look any farther than American hardwoods. American hardwoods are primarily harvested on private property (especially as agriculture in the United States declines and farmland is returned to its natural state of hardwood forestation) leading to cleaner harvesting practices. Hardwoods are also prolific re-seeders allowing reforestation to occur naturally. Independent research has also shown that American hardwoods can save natural resources, reduce landfill waste and are a carbon neutral product. Adams believes that educating the public about the quality and sustainability of American hardwoods is one of the most important aspects of his business. As soon as a hardwood tree is harvested, the life cycle of the next tree begins. Saplings automatically shoot up in response to a hardwood tree being cut down. These trees grow at a much more rapid rate than the softwood trees seen in Western Montana. “Portions of my family’s property in Ohio were timbered in the late 1960s or early 1970s and are ready to be cut again. Generally speaking, when logging hardwood forests, trees over 14-16” in diameter are cut and those under 14” are left to grow. If done correctly, hardwood forests can be harvested every 40-50 years,” Adams says. Once this timber is harvested again, the life cycle starts right over again. Using American hardwoods rather than alternatives such as exotic hardwoods or laminated products including bamboo and linoleums ultimately saves natural resources. According to analysis by the University of Wisconsin Wood Products Program, producing wood flooring takes less water and less energy to produce than other flooring options. The same research shows that wood is a carbon neutral product as it produces oxygen during its growth cycle and stores carbon during its service life. This is also true of moulding and trim products made from American hardwoods versus other heavily manufactured materials. “Let’s take bamboo flooring, for example. Bamboo is a grass, not a tree. It is cut down and produced overseas by cheap labor, it is heavily manufactured using energy and glues to press it together, then it is shipped around the world before it gets to the United States. Bamboo floors are often replaced sooner than later as they do not hold up as well as American hardwoods. This doesn’t sound very green to me. We feel it is our job to educate the public on some of the false pretenses of the promotion of the ‘green’ movement,” says Adams. Other research by the National Association of Home Builders indicates that hardwood flooring does not need to be replaced as often thus reducing landfill waste and energy use. “When asked by a client, ‘How long will this flooring or moulding last?’ my standard response is that it will last at least until your great-grandkids generation! If taken care of properly, it can last 150-200 years without a doubt,” states Adams. Over the past 50 years, floor finishes and stains and finishes used on trim products have improved immensely in regards to being “green.” “Today’s waterborne finishes are harder and have much lower volatile organic compound (VOC) levels than ever before. Homeowners and contractors get a much superior product, as the waterborne finishes can be upwards of 50% to 100% harder than even oil-modified products, and are not exposed to toxic fumes formerly found in finish products. We are seeing indications that in the near future oil-based products will be obsolete,” says Adams. According to the US EPA, the quality of indoor air with wood floors is excellent. Education is key to understanding the movement towards environmentally sound building as there is a lot of information out there that might not be accurate. “Taking the time to dig deeper and fully understand what you are being told is important. You must read the entire book, not just the cover. Many of the suppliers we deal with have been ‘green’ since before it was cool. For example, Allegheny Mountain Hardwood Flooring has been managing its own forests responsively since 1945 and was in the first few hundred companies to become FSC (Forest Stewardship Council) certified. Another example is Sheoga Hardwood Flooring which is an Amish-run mill thus they automatically use less energy in production. I really feel that American hardwoods offer quality and sustainability to consumers not found anywhere else in the industry. 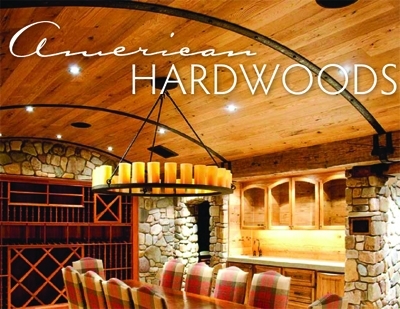 I don’t think you can go wrong with American hardwoods,” says Adams.